Heat oven to 375°F. Line 15x10x1-inch pan with foil; grease foil. In large bowl, mix meatball ingredients until well blended. 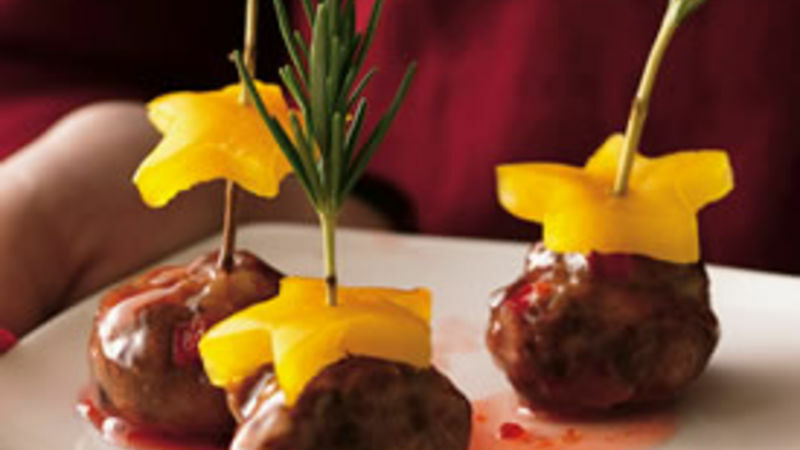 Shape into 36 (1 1/4-inch) meatballs. Place in pan. Bake 25 to 30 minutes or until thoroughly cooked and no longer pink in center. In 4-quart saucepan, mix sauce ingredients. Cook over medium heat 2 to 3 minutes, stirring constantly, until thickened. Add meatballs to sauce; stir to coat. Cook over medium-low heat 5 to 7 minutes, stirring occasionally, until hot. You’ll find a variety of colors and heat levels in the jalapeño jellies. For best results, use red or amber colored for this recipe.